Muhammad, surnamed Shams al-Din, the elder son of Imam Ruknuddin Khurshah is said to have born probably in 646/1230 in the fortress of Maimundiz during the time of Imam Alauddin Muhammad. 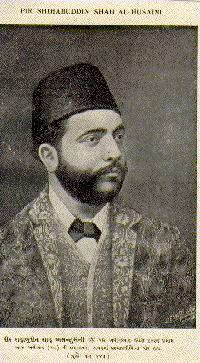 He was known as Agha Shams in Syria, and Shah Shams in India. He is also known as Shamsu'l Haq in few Iranian poems. Poet Nizari Kohistani (d. 720/1320) called him Shamsuddin Shah Nimroz Ali and Shah Shams. He is also said to have been known as Shams Zardozi owing to residing in the village, called Zardoz in Azerbaijan, but another tradition suggests that he had adopted profession of embroidery and silk to sustain his family, therefore, the term zardoz (embroiderer) became his title. The butchery of the Ismailis conducted by the Mongols in Qazwin and Rudhbar following the reduction of Alamut, is taken by Ata Malik Juvaini conclusively as an end of the Ismailis and the unbroken line of the Imamate as well. There appears however vacuous reports for the descendants of Ruknuddin Khurshah and his followers in the work of Juvaini. He writes in his "Tarikh-i Jhangusha" (tr. J.A. Boyle, Cambridge, 1958) that, "Ruknu-ad-Din now saw what he had to expect and realize that he could not resist. The next day (November 16, 1256), he sent out his son, his only one, and another brother called Iran-Shah with a delegation of notables, officials and leaders of his people" (p. 717). 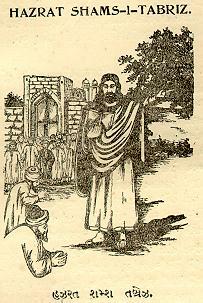 This was Juvaini's first narrative when Alamut was being reduced, but while describing the brutal massacre of the Ismailis after about a year, he writes, "And Qaraqai Bitikohi went to Qazwin with the order that Rukn-ad-Din's sons and daughters, brothers and sisters and all of his seed and family should be laid on the fire of annihilation" (p. 723). Juvaini writes in the first phrase, "his son, his only one" (pesr khudra ki hama'n yak pesr), and then writes in contrast in the second phrase, "sons and daughters" (banin wa bannat). It implies clearly that Juvaini contradicts his own account, as he had no knowledge of an exact figure of the sons of Ruknuddin Khurshah. Moreover, Juvaini was not present during the fall of Maimundiz on November 19, 1256 where the family of Ruknuddin Khurshah resided, and therefore, his account cannot be trustworthy and reliable. It is however, known from few Iranian manuscripts that Shamsuddin Muhammad had steathily escorted out of the fortress of Maimundiz most probably on 11th Shawal, 654/November 1, 1256; and the Mongols reached there on 17th Shawal, 654/November 7, 1256; while Juvaini himself joined the Mongol after 12th Zilkada, 654/December 2, 1256. The extermination of the descendants of Ruknuddin Khurshah, as boasted by Juvaini is not to be trusted. It may be surmised in a question that Nasiruddin Tusi was the only person in the fortress of Maimundiz, from whom the internal affairs during the reduction of the Alamut can be well expected. It seems that he divulged nothing about it, suggesting his strictness in taqiya. Halagu however, included him in his forthcoming operations, impelling some scholars to draw a conclusion that he had given up Ismailism. Granted that Nasiruddin Tusi had abandoned, the Mongols must have known the trace of Shamsuddin Muhammad from him, but it cannot be ascertained. It appears almost conclusively that the prime objective of Halagu was to reduce the Ismaili powers, and the family members he had seen with Ruknuddin Khurshah dismounting from Maimundiz was enough for him to understand them as an entire family. It is however worth noting that Shahanshah, Iranshah and Shiranshah; the brothers of Ruknuddin Khurshah had personally come into the contact of Halagu during negotiations, and the whole family members later on were detained at Qazwin, where Shahanshah was significantly absent as he had fled with Shamsuddin Muhammad. No investigation had been made for Shahanshah, which transpires that the Mongols aimed mainly on the reduction of the Ismaili powers without taking notice of the descendants of Ruknuddin Khurshah. To summarize briefly, the Mongols were quite unknown with the other side of the coin. Scanning the meagre chains of few anonymous manuscripts, and the sparsely records of the traditions, it seems fairly certain that after leaving the fortress, Shamsuddin Muhammad arrived safely in Daylam with his uncle Shahanshah in eastern Gilan. The famous Ismaili dai Pir Shams (d. 757/1356) had seen him in his early life at Daylam, which he has recounted in his "Chandrabann" (p. 40). It has been indicated in the previous chapter that Imam Jalaluddin Hasan (d. 618/1221) was quick to diagnose the gushing forth of the Mongol storms in Iran, and therefore, he had taken few precautionary measures. He had commanded his army and gone to Arran and Azerbaijan to help Muzaffaruddin Uzbek, the Ildenizid ruler to fight against Nasiruddin Mengali in 610/1214. Jalaluddin Hasan seems to have prolonged his stay deliberately for 3 to 4 months, and selected most suitable zone to seek refuge for himself, or any other Imam in his descent during the time of Mongol's massacres. It seems probable that he had designed a safe route from Alamut to Azerbaijan. His great grandson, Shamsuddin Muhammad was finally destined to repair in Azerbaijan, most possibly on the tract mapped out in 611/1215. Shamsuddin Muhammad would have arrived in Daylam before fall of Alamut, and thence he is reported to have stayed in the house of Kai-Ka'us bin Shahanshah at Kutum, a district of Gilan lying to the west of Safid-Rud. Kai-Ka'us was the brother of the wife of Imam Jalaluddin Hasan, and the hereditary ruler of Kutum, who lived till 658/1260. It seems likely that Shamsuddin Muhammad had been well treated at Kutum before resuming his onward journey. Shamsuddin Muhammad further moved to Ardabil and in the surrounding towns. It is said that he also lived in Ahar, lying about 150 miles west of Ardabil. He is reported to have lived also in Tabriz, which he most possibly evacuated in the early months of 1257 as Halagu invaded Tabriz on July 26, 1257. He seems to have been known as Shams Tabriz by the local Sufis in Tabriz. Pir Shihabuddin Shah (d. 1884) writes in "Khitabat-i Alliya" (Tehran, 1963, p. 42) that, "Shamsuddin Muhammad who lived in Tabriz, was compared by the local people to the sun, because of his handsome countenance, and thus he came to be called Shams (the sun) of Tabriz. This gave rise to the confusion between him and Shams Tabrizi, the master of Jalaluddin Rumi, but they were always in reality two different persons." It is also related that he passed considerable time in Angoda, lying on the old route linking Ispahan and Hamdan. In sum, the accessible fragments suggest that Shamsuddin Muhammad most probably lived from one to another place under different mantles in the province of Azerbaijan. The veritable locality of his residence, however, has not been substantiated. Azerbaijan was a big province spread over 104000 square kilometers, bounded on the south-east by Jibal, on the south-west by the eastern Jazira, on the west by Armenia, on the north by Arren, and on the east by shore-lands of the Caspian Sea and Gilan. The most famous towns in Azerbaijan were Tabriz, Ardabil, Ahar, Angoda, Urmiya, Marand, Khwai, Dilman, Miyana, Taruj, Laylan, Julfah, Nakjawin, etc. The north-eastern part of the province was thickly populated by the Turkomans, and the south-western was inhabited by the Kurds. Azerbaijan was a fertile land for the growing Sufi circles, and Shamsuddin Muhammad had settled in northern region with his family, where he professed in silk and embroidery works, for which the region was noted at that time. Abul Fida (d. 732/1331) writes in "Taqwin al-Buldan" that, "The northern region of Azerbaijan was rich with the products of silk and embroidery works. The silkworms fed on the oak trees and that the women went out to gather it up, and afterwards dried it in an oven on brass pans." Summing up the travel of Shamsuddin Muhammad from Maimundiz to Azerbaijan, it seems certain that there were hardly four to five main stations where he had effected junctions during the whole journey. He seems to have left behind at least two trusted dais at each station before he embarked, so that the necessary information be communicated from one to another station. It is most certain that poet Nizari Kohistani (d. 720/1320) had reached the residence of Shamsuddin Muhammad at Azerbaijan after getting information very privily from the above daisat any station, most probably at Tabriz. It was however most difficult for him to trace out the hidden Imam in a big province, had he not known the clues. The period under review is noted to have left the Ismaili mission in disarray and it appears that in many regions, it was conducted passively and that too very secretly in accordance with the directives of the elder persons. However, the period between 1257 and 1265 was possibly barren for the dawa, but was noted for the Ismailis in searching peaceful regions. They had absolutely lost their contact with the Imam. The Syrian Ismailis seem to have acquired few clues of Imam's whereabouts, and some of them had travelled towards Azerbaijan by taking routes of Jazira and Mosul in the cloaks of the Sufis or traders. The deprivation of regular guidance from the Imam had compelled the surviving Ismailis to observe strict taqiya by taking a flood of inspiration and fillip from the events of their past history. After Alamut operations, Halagu marched on Baghdad and reached on January 18, 1258. On January 30, the Mongols opened a heavy bombardment. On the morning of Wednesday, February 13, 1258, the Mongols entered Baghdad. The citizens were mercilessly massacred, and the city was plundered and then set on fire. Thus, Baghdad, the proud capital of the Abbasids, was razed to dust, groaning under the pagan heels of the Mongols. Diyarbakri (d. 982/1574) writes in "Tarikh-i Khamis"that, "The massacre continued in Baghdad for 34 days during which 1,80,000 persons were put to the sword. For four days, the blood ran freely in the streets and the water of Tigris was dyed red for miles." The savage massacres can be further judged from the example quoted by Steven Runciman in "A History of the Crusades" (London, 1954, p. 303) that, "One Mongol found in a side-street forty new born babies, whose mothers were died. As an act of mercy, he slaughtered them, knowing that they could not survive with no one to suckle them." The victorious army pursued and attacked at full gallop. The 37th Abbasid caliph al-Mustasim (640-656/1242-1258) was destined to be the last caliph, and was beaten to death on Halagu's orders, and according to another version, trampled on by horses. Abul Faraj writes in "Tarikh Mukhtasar al-Duwal" (pp. 445- 6) that, "The Abbasid caliph al-Mutasim was devoted to entertainment and pleasure, passionately addicted to playing with birds, and dominated by women. He was a man of poor judgement, irresolute, and neglectful of what is needful for the conduct of government. When he was told what he ought to do in the matter of the Tatars, either to propitiate them, enter into their obedience and take steps to gain their goodwill, or else to muster his armies and encounter them on the borders of Khorasan before they could prevail and conquer Iraq, he used to say, `Baghdad is enough for me, and they will not begrudge me if I renounce all the other countries to them. Nor will they attack me when I am in it, for it is my house and my residence.' Such baseless fancies and the like prevented him from taking proper action, and so he was stricken by calamities which he had never imagined." In sum, Prof. Masudul Hasan writes in "History of Islam" (Lahore, 1987, 2nd vol., p. 192) that, "The gravest fault of the Abbasid caliphs was that they suffered the state to be fragmented thereby weakening the power structure and exposing the state to foreign attack. Thus our value-judgement is that the Abbasid caliphs were themselves responsible for their fall." According to Vladimir Minorsky in "Iran: Opposition, Martyrdom and Revolt" (Chicago, 1955, p. 192), "Ata Malik Juvaini sheds tears over the misfortunes of the Muslims, and at the same time attributes to his infidel masters the role of those of whom God said: `They are My troops through whom I take My vengeance upon the rebels.'" Halagu's third major campaign was directed against the Ayyubids in Syria. He seized Aleppo in 658/1260, while his commander, Ket-Buqa made his triumphal entry in Damascus on Rabi I, 658/March, 1260. It was the same year that four Ismaili strongholds, including Masiyaf were surrendered to the Mongols. Halagu had to return to Iran upon hearing the news of Mongke's death in 657/1259. On 25th Ramdan, 658/September 3, 1260, the Mongols suffered a drastic defeat at Ayn Jalut (Goliath's Spring) near Nazareth in Palestine at the hands of the Mamluk armies of Egypt. Ket-Buqa was taken prisoner and scourged to death. Ayn Jalut was one of the world's decisive battles. The Muslim Asia seemingly on the verge of ruin, made a surprising recovery. Ayn Jalut destroyed the Mongol power and kept the pagan hordes out of Egypt and the Maghrib. Soon afterwards, the Mongols were expelled from all of Syria, where the Mamluk sultan Baybars rapidly emerged as the ruling power, and became an unchallenged ruler of Egypt and Syria. The Ismailis evidently collaborated with the Mamluk sultan and other Muslim rulers in repelling the Mongols from Syria, and after the battle of Ayn Jalut in 658/1260, they recovered their four strongholds. If a balance sheet of the merciless massacres is drawn up, the most modest estimate reveals that the Mongols during the period between 1228 and 1260 had slaughtered at least eight million Muslims in cold blood for the establishment of their political authority over the Muslim lands.